Donna, I had to enter pretty Rudy in my Jack-of-the-Month for December. Can you tell us a few things about him in the comments form, especially his relationship with that beautiful cat? Thanks for sharing Rudy with us. Donna what a perfect little dog. Thank you for sharing this with us. Thank you for posting Rudy. He found me at a horse show in californiam while I was on a business trip this summer. 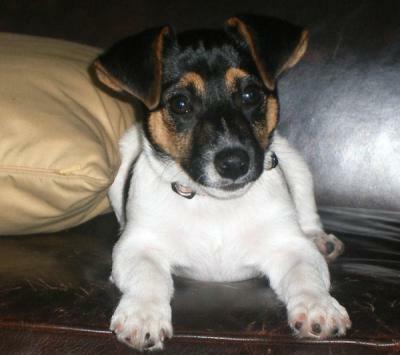 I did not really know much about Jack russels and was not in the market for a dog, but I fell in love with him and was not leaving California with out him. I brought him home to two cats Ralph and Sydney and after 5 months together they are fianlly finding their way together. Ralph, in the picture, thinks he is my boyfriend and was a bit appalled when I brought this little puppy home but slowly and surly they are finding ways to exists and even enjoy each other. Rudy has turned out to be one of the biggest pleasures in my life and literally touches everyone he come in contact with. He can get along with any dog and always goes up the owner as well, as if to ask if he may play with their dog. Everyone get equal treatment. My puppy class traniner said that he is the most well behaved JRT she has ever encountered and has used him as a good example, for her other classes.